How are the mighty fallen? The good news is that some Nigerians are getting better, wiser and sober when choosing and rejecting politicians. We expect more sophisticated voters for the next Gubernatorial Election. While it is true that too many still vote on selfish, emotional and ethnic attachments; we are witnessing a class of voters voting beyond stomach infrastructure. We are now realizing that the hands of politicians are the wrong place to put all our trust and destiny just because they choose enemies for us. These godfathers are the real enemies we need to disgrace. Presidential Election is done, vote regardless of Party Affiliations and for the candidates that will implement the interest of your state. Divided States votes reflects sophistication and principle beyond primordial instincts. Ironically, most of those that are godfathers today rejected their own godfathers after getting the Golden Fleeces. Saraki rejected his own father as political godfather, Tinubu sent Pa Dawodu to grave in regret and Oshiomole rejected Anenih’s demands. But note that our first Prime Minister did not forget that Ahmadu Bello put him there unlike the enmity between Akintola and Awolowo. Obasanjo had crowned more Heads of State than other Godfathers but he was soundly rejected this time around. He overstayed his welcome as a political kingmaker. Most of the Presidential candidates usually parade themselves for these juggernauts fearing their political ambitions would be crushed without their blessings. It is not only immunity that godfathers demand: not be touched or probed for past transgressions but that they would get a cut of new loots and present candidates for juicy positions in government. Nevertheless, Saraki and Tinubu share the same trait, privilege and belong to the same class of Machiavellianism. There are those that want to die with everything they acquired in life like the ancient Pharaoh. The Gubernatorial Election will show us how many more of the godfathers, Mighty, Powerful men of “Timber and Caliber” will fall. It is up to you, regardless of parties. No Nigerian should see himself as loser or winner until all the godfathers are sent home. State governments have more impact on your lives if your resources and income are not sucked off by a selected few. Do not fool yourself, no state is living up to the potential of its income. We are in the life of a one-eye man thankful that he is not totally blind. No gubernatorial candidate can win a state on the propaganda of non-indigene. Indeed, such support can be detrimental. There are a few more politicians that have been more reckless and indifferent, prostituting in and out of political parties like Bukola Saraki. Kwara finally woke up and sent him to ignominious defeat from his own state. No matter what our reservation is about democracy, it has been useful in sorting out garbage for recycling them into the next life. The stench some created and introduced into our debased communities would take some time to deodorize. Buhari played his game well and he was forced to collaborate with Tinubu out of political expediency and for existential reasons. Buhari learnt after contesting a few times that he could not put all his eggs in one basket. The North under one people and one destiny has been shattered: divided into three, leaving him to North-East and North-West as his reliable base while North-Central has slipped away. In 1983 Buhari had tried to make up in the South by forming alliance with Okadigbo but lost against Obasanjo/Atiku ticket. Even North traditional foothold in the South, South-South is no longer reliable. In Presidential Election, they allied with South-East because former President Jonathan had been displaced after gaining votes North and South in the first election he won. This alliance cannot be relied on since they fear being swallowed by either the South-West or South-East. This is for the same reason in 1979, Gov. Ambrose Alli Bendel State alliance with South-West did not last past 1983. 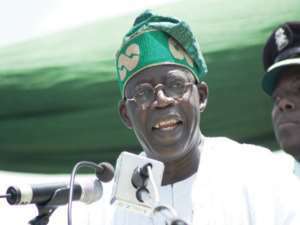 Though Tinubu was able to deliver divided West as expected in 2016, the adhesive force Tinubu had then has withered due to arrogance, overconfidence and indifference to those that helped him climbed in Lagos at the expense and demise of Funsho Williams. The arbitrary choice of candidates for political offices from local to state government has become overbearing. Indeed, Tinubu preferred one term candidates so that he could retain his grip on their successors. It was not long ago that he tried and failed to torpedo Fashola for his second term. Oba Eko that should have respected himself by wisely playing down his involvement into politics, actually got Fashola to agree to Tinubu terms or “contract” on Lagos State; to satisfy his avarice since the Oba wanted his own cut as well. It was an ugly fight between Tinubu and Fashola. But Tinubu got his piece of flesh as Fashola got his second opportunity to contest and won. Ambode was not so successful. Tinubu enjoys the power to bring anyone he wants, his wife, daughter, son-in-law or son; even from nowhere and promise them positions beyond their dreams as long as they accept his terms. This was the case with Fashola and Ambode. By the time these men realize the gravity of their complicity in deals, they had to submit to Tinubu. They had limited options but deeply involved in aiding and abetting financial crimes that could throw them in jail if and when exposed. Their collaboration was a safety insurance for Tinubu! Tinubu, no matter how clever or cunning he is can never get off scot free wishing him long life. Indeed, his time to pay for the consequences of voracious appetite has come. Many of the Yoruba that accepted him based it on the devil they know compared to that they do not know. Many of us usually wonder why a Yahoo Yahoo boy would not stop, a drug dealer would not quit or a looter would not stop and invest the money they made into some legitimate business. It is for the same reason most of us enjoy certain power, privilege, love certain materials, position or crowd. We get so used to certain way of life, it becomes inconvenient to change from a game you know so well to a new one. Many rich people do change before we associate past odious practices with them. Others are forgiven while many repent and gave most of their money away to good causes. We have Saraki and Tinubu as godfathers in every state. Indeed, some of the grudge against Buhari were that he closed godfathers’ source of illegal incomes, rejected their nominations for positions and stifled their influence. Those actions have reduced or eliminated their reach into his Government. Some folks claimed that closing the flow of money by implementing Single Account also affected the Economy because wasteful spending to cronies ceased. Even pastors have to put their personal aircrafts up for sale since they got away with maintenance and service fees. This author has authored 488 publications on Modern Ghana.